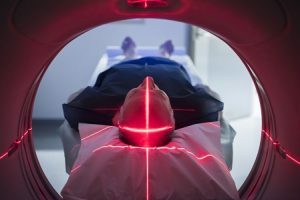 Do CT Scans Increase Your Cancer Risk? Not only are they completely useless for identifying the source of your back pain, it’s been proven that back pain sufferers who have these tests end up WORSE off than those who don’t. The most dangerous of these tests is the CT scan. CT scans dramatically increase your risk of developing a fatal cancer. 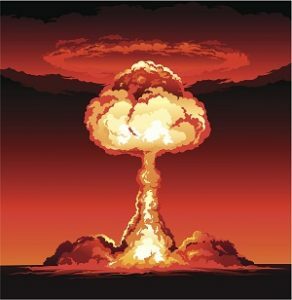 A single CT scan subjects you to about the same level of radiation some survivors of the Hiroshima and Nagasaki atomic bombs were exposed to in WWII! Those mega-doses of radiation damage your DNA. That can lead to the growth of tumors. The amount of radiation you get from one CT scan is about 150 to 1,000 times the amount of radiation of a standard x-ray. According to researchers at the National Cancer Institute, your risk of developing a fatal cancer from a scan is 1 in 2,000. That means about 30,000 new cancer cases and 15,000 deaths every year caused just by CT scans! And it’s not like your doctor doesn’t know imaging tests are worthless for diagnosing the cause of your lower back pain. A recent study published in JAMA Internal Medicine showed they definitely do! Researchers asked 580 medical practitioners whether or not they would order a CT scan or MRI for a hypothetical 45-year-old women with lower back pain. The fictional patient had no “red flags.” Or, no signs that something serious was wrong. Our study showed that almost all clinicians were aware that an imaging test was not indicated for a patient with low back pain without danger signals of severe spinal problems… only 3 percent thought a CT or MRI would benefit this patient. 97% of medical “experts” knew there was no benefit to the tests… yet MORE THAN FIFTY PERCENT of patients are still being referred for these tests. If you absolutely HAVE to have a CT scan—or if you’ve already had one—I recommend loading up on vitamin C. Higher doses (2,000 mg and above) of this potent antioxidant fights free-radical damage caused by radiation. It can aso repair DNA damage caused by a CT scan. Why do doctors order CT scans for lower back pain? Doctors continue to order these worthless and dangerous tests because they have NO IDEA what causes lower back pain—or how to treat it. It’s one of the most common reasons people visit a doctor, or go to the emergency room, and mainstream medicine STILL hasn’t figured it out. Unless you understand the foundational causes of your pain. I’m talking about muscle imbalances that pull your spine out of alignment, putting high levels of stress on certain muscles, bones and joints. And I know firsthand how well it works because it changed my life. It helped me get rid of my own pain. My Lose the Back Pain System gives you all the tools you need to help relieve neck pain, back pain, joint pain, sciatica, or any other annoying ache that just won’t go away. I get emails every single day from satisfied customers telling me how thankful they are to have found this amazing system. Do you want to live a pain-free life? Are you already thinking about all the things you’d like to do… places you’d like to go… new things you’d like to try… IF you weren’t in pain? If you answered “YES” to any of those questions, I urge you to try my Lose the Back Pain System right away. So you’ve got nothing to lose (except your pain). Semelka RC, Armao DM, Elias J, Jr., Huda W. Imaging strategies to reduce the risk of radiation in CT studies, including selective substitution with MRI. J Magn Reson Imaging. 2007 May;25(5):900-9. Improving the Safety of Medical Imaging. Testimony before the Subcommittee on Health. U.S. House of Representatives. Storrs C. Do CT scans cause cancer? Sci Am. 2013 Jul;309(1):30-2. Sears ED, Caverly TJ, Kullgren JT, Fagerlin A, Zikmund-Fisher BJ, Prenovost K, Kerr EA. Clinicians’ Perceptions of Barriers to Avoiding Inappropriate Imaging for Low Back Pain—Knowing Is Not Enough. JAMA Intern Med. 2016;176(12):1866–1868. Indian Lettuce; as a pain reliever, but I don’t know the dose. I’m allergetic to Morphine, but not to Indian Lettuce. After brewing up a batch, I still don’t know the dosage amount, for the relief of pain in my joints. What about a Ct scan for lung nodules? Can I still load up on vitamin C? Have test already scheduled for next week with contrast. Appreciate your Antwerp. We recommend loading up on Vitamin C for anyone facing any sort of health challenge. Just remember to look for a whole food source supplement of Vitamin C, not just ascorbic acid. If you have any specific health concerns regarding taking the vitamin or any other supplement, always check with your doctor as we cannot by law provide personal medical advice. Where did you get those ratios of comparison to x-rays, dental scans and airport scans from? Would you please send me the actual link? Look forward to your communications. tank you have just received Heal and soothe bottle.